The combination of MELAG expertise and experience with Class B steam sterilizers has produced something great: the new Premium-Class Evolution series. The patented MELAG double jacket technology and DRYtelligence® intelligent drying of Vacuklav Premium-Class Evolution steam sterilizers enable record-breaking operating times. Our patented double-jacket technology brings record-breaking operating times. Vacuklav 41 B+ Evolution is a high-performance stand-alone steam sterilizer with an efficient cooling system and DRYtelligence intelligent drying. Vacuklav 43 B+ Evolution provides record-breaking operating times, even with maximum loading of its especially-large sterilization chamber. This is rounded off by our DRYtelligence which ensures the best-possible drying outcome. Setting the ultimate benchmark: the innovative product features of the high-performance Vacuklav 40 B+ Evolution steam sterilizer with its fixed water connection produces reliable and very fast process times to ensure the highest of quality. Innovation and volume. With a chamber depth of 45 cm, the combination of the patented double jacket technology and DRYtelligence, Vacuklav 44 B+ Evolution ensures reliable sterilization of up to 9 kg of instruments in the shortest possible time. Whatever the context in which the steam sterilizer is deployed, the Premium-Class Evolution series provides maximum reliability and flexibility. Whether with a fixed water connection or as a stand-alone solution, they are suitable for any installation situation in a practice and clinic setting. MELAG provides steam sterilizers of the Evolution series with different-sized sterilization chambers to accommodate various types and quantities of instruments. Choose from a chamber depth of 35 cm or 45 cm for especially long instruments. Opening its practice in 2018, the three-practitioner OMFS practice GesichtsPunkt knew that they needed the maximum of safety and reliability and decided that only the best modern technology would do. Their need for efficient and ergonomic procedures is entirely satisfied by the MELAG Premium-Class Evolution steam sterilizers integrated in their MELAG system solution. Find out more about the sterilization procedures of the OMFS practice GesichtsPunkt. OMFS practice GesichtsPunkt. Since opening in 2011, the practice has been entirely satisfied with their MELAG steam sterilizer, sealing device and washer disinfector. Two dentists treat up to 90 patients per day in five treatment rooms. The short sterilization procedures provided by our Premium-Class steam sterilizers ensure highly efficient processes. Even complex hollow body instruments are no problem for the MELAG high-performance Class B steam sterilizers. Dr Philipp Gebhardt relies on the optimal workflows of his MELAG system solution to ensure the highest decontamination standards in his orthodontic clinic. Treating up to 60 patients per day, the clinic Biss45 trusts the MELAG system solution to ensure safety and efficiency in instrument reprocessing. Using the MELAG Class B steam sterilizer means that the practice team is also able to sterilize critical instruments with complex hollow bodies. Dental practices and clinics place high requirements on instrument decontamination processes. They need safe and legally compliant instrument reprocessing workflows to ensure the best-possible level of protection for staff and patients alike, whilst ensuring efficient working practices, quick instrument availability and saving resources. The Premium-Class Evolution Class B steam sterilizers reprocess all the sterilization material and instruments produced by a dental practice and clinic in a safe fashion. 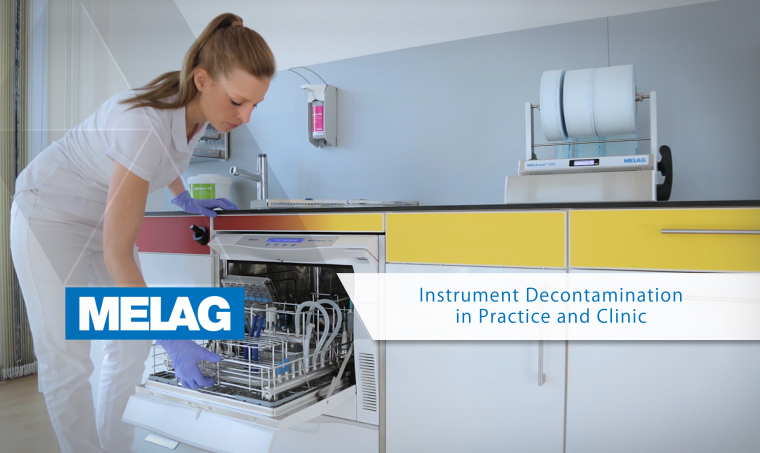 Even complex hollow body instruments such as turbines or handpieces (transfer instruments) present no challenge for the fractionated pre-vacuum of the MELAG Class B sterilization procedure. The short program cycles provided by the steam sterilizers of our Premium-Class Evolution series and the innovative DRYtelligence intelligent drying system mean especially quick, material-friendly and energy-efficient instrument decontamination. These unique product highlights protect high-quality instruments over the long-term. The steam sterilization of individually-wrapped instruments or surgical sets in containers is no problem for the steam sterilizers of the Premium-Class Evolution series. The mount in the steam sterilizer enable the insertion of up to eight trays or three containers. Leaving out the mount means the ability to sterilize up to four sterilization containers (e.g. MELAstore-Box 100) stacked on top of each other in the sterilization chamber. Our innovative DRYtelligence technology ensures the best drying results even with a loading capacity of 9 kg for instruments. Successful sterilization, especially of hollow body instruments in a Class B steam sterilizer can be subject to reliable inspection using a helix test body in accordance with international standards. It is recommended to always use the test body when sterilizing hollow body instruments such as ultrasonic scaler tips and transfer instruments. MELAcontrol and MELAcontrol Pro are two test bodies for batch control. After the documentation and approval of the sterilization batch via the XXL colour touch-display, the practice team can dispose the test strips of the helix test body. In addition, all vital parameters of the sterilization process are documented in the log files. The logs can be issued directly via the integrated CF card or using a network cable. The integrated documentation and approval software of the Evolution series obviates the need for a sterilization and approval book. The steam sterilizers can also be connected with the MELAprint 60 label printer. The label printer prints bar codes for marking the sterilized and packed instruments in a practice and clinic context. All the relevant information is recorded on the bar code labels: sterilization batch, user ID, the sterilization date and expiry date. After use, the double-adhesive labels are simply separated from the instrument film and transferred to the patient records. The use of an additional bar code scanner to trace the documentation can save even more time. The scanner permits direct assignment of the sterilization batch to the patient records e.g. in the practice or clinic software. We rely on the integrated MELAG system solution because patient safety starts with sterile instruments and first-rate hygiene standards. The MELAG system solution provides us with more time and maximum safety for our patients and staff members.